On May 29 2015, TSTT posted an email advisory that for its email customers using tstt.net.tt that it will be discontinuing hosting of email addresses at tstt.net.tt by June 30 2015 July 31 2015 and advising that users should migrate their data before June 30 2015 and a link to https://sites.google.com/a/tstt.net.tt/google-phaseout/ to discuss how users can backup or migrate their data to other cloud services. 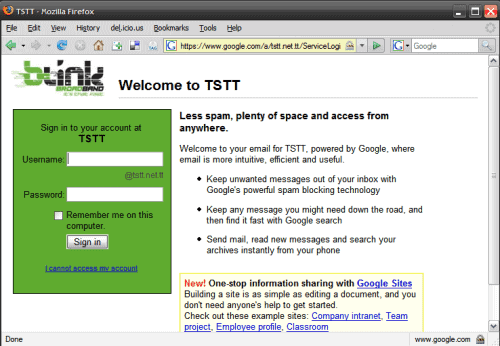 But why did TSTT discontinue email hosting of emails @tstt.net.tt? The email advisory cites the reason for this was Google’s decision to shut down its Google Apps for ISP service. However, last year, Google announced that it was discontinuing its program (with admittedly little fanfare), according to this forum thread. An article in Viodi.com discusses the impact of the discontinuation of the Google Apps for ISPs service to small, rural ISPs. And the challenges noted in that article were likely also faced by TSTT, leading to its decision to simply discontinue email hosting under tstt.net.tt. Blink is implementing a number of service and infrastructure projects to better serve our customers and continuously improve our standard of quality and reliability. One of these projects involves enhancing our email service capacity by reclaiming resources that had been locked in to maintaining inactive accounts. By freeing up these resources we can offer an even more cost effective and reliable service to customers. In accordance with our policy, an inactive account is one in which the account owner has not signed in for 3 months or more or, it is a newly activated account in which the owner has not logged in within the first 30 days after being assigned the account. Effective November 1st 2014 we will be reviewing the status of all tstt.net.tt email accounts with the aim of closing off inactive accounts as defined above. Note this will not affect customers’ Internet Access service, just their TSTT email account. Once an account is declared inactive, all messages, folders, and contacts will be deleted and incoming messages will be blocked. The message sender will receive a reply indicating that the mail could not be delivered. The TSTT customer’s user account name will be held in reserve for an additional 30 days in the event that they have an interest in re-activating the account. After the additional 30 days, if there is still no log on attempts by the user, the account name will be permanently deleted. Google’s notice to ISP’s on the termination of Google Apps Partner Edition also mentions two resources of interest: An Administrator transition resource website at https://support.google.com/appstransition/go/admin (for the ISP) and an End User resource website at https://support.google.com/appstransition. Next Next post: Trinidad and Tobago Computer Society lime on June 10 2015 from 7 to 9pm ; please RSVP!